Amazing Food, Sites and Weather and new Forever Friends! the trip was so well planned and so much information was shared by our very knowledgeable tour guide Liz! Unfortunately at two of our hotels our view was non existent as opposed to our other travelling companions. In Tolo our room overlooked an alley and a garage roof, whereas our friends had gorgeous water views.As well as no view there was road noise and foot traffic behind us and then in Santorini, the resort was beautiful, however we also had a room near the parking lot and an outdoor sitting area that was so small and viewed the wall, whereas most of our friends had gorgeous views and large outdoor space. I feel we did not get the same value for our accommodations as our friends did and we all paid the same for the trip. This needs to be improved! walking the Caldera in Santorini with breathtaking views! Regretfully not enough time to get to the beaches or swim in the hot springs! Thank you for traveling with Collette to Greece and Its Islands. Your feedback will be reviewed by the Product Design Team in order to improve the overall touring experience for our guests. Overall, good information provided prior to trip. However, I did not receive the final packet (with plane e-tickets) until less than 10 days before the trip. Also, when I had problems confirming my flight on-line, the Collette's customer service person said she could not help me. We went to amazing places. The first week was a little bit packed with activities, but there was sufficient "down time" for me. The second week, in Mykonos and Santorini was wonderful - beautiful places and lots of free time to explore. This was my fourth Collette tour, and I'd rate the others higher, partly because two of the hotels on this one were poor, and in another there was only cold water out of the shower, and we were there for three days. The Tour Director makes all the difference, however, and ours was very very good. Thank you for traveling with Collette to Greece. A member of the Guest Relations Team will be reaching out to discuss your feedback. Some doubt as to whether we will future book with Collette! One of our most disappointing tours with Collette. Our guide was on an ego trip as we suffered thru her boring, inane personal riffs. Our return flight home was cancelled resulting in discomfort, inconvenience and changed plans at the end of our tour. Thank you for traveling with Collette to Greece. A member of the Guest Relations Team will follow up with you. Wasn't terribly thrilled with our tour guide. Too much of her and not enough of who she was guiding. Homeword flight cancelled, causing delays, inconveniences and an exhausting finale to our tour. Just a poor experience, untypical of Collette. We thought the tour could improve on time management - lots of lost time. Specifically, the day we ferried to Mykonos we were on the 4:45 pm ferry. No planned activities that day so they took us to Nafplio and let us wonder around on our own for an hour. Would have enjoyed more time in Nafplio with a tour or an earlier ferry to Mykonos. For lunch that day they took us to a bus rest stop. Wasted day. The hotel in Mykonos was not near anything. Hotel ran a shuttle into town, but the shuttle only ran every 2 hours. Then on final day, arrived at our hotel in Athens at 1:30. Hotel was not near anything and a cab into central Athens could have cost roundtrip over 100 euros. A hotel more central so we could have enjoyed Athens would have been great. Tour guide was inexperienced -her first trip with Collette. She tried real hard but her inexperience was a apparent. Favorite memory - the optional food tour in Athens and the catamaran trip we took on our own in Santorini. Local tour guides were excellent. Two hotels were very disappointing - very old and outdated. (One hotel you couldn't get WiFi anywhere in the hotel) Location of hotels was below average compared to other tours we have taken - attractions not within walking distance or cab friendly. Qualilty of meals were mixed - some really good, others just fair. Great trip for understanding the history and beauty of Greece. The vacation was very well planned and the accommodations were excellent. The only criticism I have is more variety in foods. Our Tour manager was truly delightful. She bent over backwards to make sure we were taken care of. She also had cute sense of humor that I appreciated very much. Great overall tour. It was well organized to get a feel for the history and beauty of Greece. The tour manager was outstanding. She always tried to listen and cater to the needs of the people on the tour. She had a delightful sense of humor and warm personality. I thought the whole Tour was wonderful. The Hotel in Santorini was amazing. Food was delicious everywhere we went. The Tour of the Olive Farm was fantastic as was the cooking class we went to. Beautiful country and great food. I would suggest that walking the streets of Athens to the restaurant after being up for 34 hours was a bit too much. I would also suggest not using the subway since one of our members was pickpocketed. Our luggage on the ferries was not secure. Anyone could have grabbed our luggage and walked off the ferry. Liz made the trip a success. Saw alot in a short amount of time. We joined the tour a day later, we were met at the airport and checked into the hotel. We met up with the tour guide later that day and she provided us will all necessary information. The tour for us began the next morning. There was a good mix of culture and history and fun. All of the hotels except one were excellent. The group dinners were outstanding. All of the tour guides were excellent and they did a great job of getting us to locations before the cruise ships, or other tour buses showed up. The hotels selected (except one) were excellent along with the tour guides. Everything was arranged we just had to pack our bags and go. Fascinating locations a wonderful guide. Great tour group, too. We thoroughly enjoyed our tour of Greece. It was a bit too long (14 days), though we don't know what we would eliminate to shorten it. We appreciated having the free days/time on Mykonos and Santorini. The front part of the tour was very busy, early mornings and lots of walking, some of it quite steep. I would average the trip as a 4 on strenuous walking, etc. We could do it, but there were a few who had canes and could not climb the steep steps. We loved all the spots that we visited. Hotel in Meteore was unsatisfactory, bad mattresses and terrible food at lunch restaurant. First off, we had an awesome tour manager, Lucy. She spoke the language and even lived in Greece, giving us more insight of the place that we appreciated. Collette did a great job on picking places to see and places to eat. The day tours and tour guides were all amazing! One too many ruins but looking back on my pics, I'm grateful we got to see all of that. Some hotels were better than others but wait till you get to the islands! Then you are suddenly on another planet, enjoying, relaxing, exploring and loving life! I wish there was an extra day in Mykonos because we loved it so much! Highly recommend this tour. The tour was great! It's a lot of early mornings but worth it to see so much in one day. Arcopolis was wonderful! Tour in Delphi was great too! My favorite was the islands, more Mykonos. It was so beautiful there and people were so incredibly nice. I enjoyed the tour to the fullest, the places we visited were amazing. Well planned, great guides, the tour manager was excellent. Our Greece experience is so much fun with great wealth of knowledge. ******* is exceptionally incredible tour manager. Her concern for the group is genuine. She knows how to handle us with great respect. When I lost my jewelry that I just bought she didn’t stop until she found it. The best one was her airport information. It was indeed very helpful when our Athens flight was delayed causing a domino effect on our connecting flight to US. Thanks to her info we were able to manage to get our connecting flight except our luggages we’re delayed. As an avid travelers collette always met our expectations. It had the destinations that we were looking for regarding Greece. Service was good and well planned. Choice of dinners were repetitive. The itinerary of this tour is excellent. I did this tour two years ago and wanted to return to Greece and decided doing the tour again was the best way to experience the places again. This time the tour manager was only okay. She did not meet 6 of us at the airport and we had to wait an hour for the bus driver to come to us. Also, she was not very knowledgeable about the country and its traditions the way the 2015 tour manager was. Although she was good at managing the details of the tour, she made little effort to engage with the 32 of us in her group. This tour is a perfect mix of studying Greek history and relaxing in the islands. As I researched tours by other groups, the Collette tour is the most extensive. Horrible tour director beginning with the lack of being met by collette after a 9 hour flight. The tour director was not up to par for Collette standard. The big plus was the tour manager. Give all the credit to Heaher -- she was exceptional -- gave us good information, was always there for us, even took photos of the whole group along us by ourselves on this tour and emailing it to us. Too -- good weather played it toll. I had a wonderful time. 2 ferry ride, along with a plane ride from the island to Athens and bus tour. Greece is beautiful and a learning experience. Everything on the tour went together beautifully. No problems, great guides and great weather. The tour took in so much. The guide was great and her knowledge was amazing. Great tour and outstanding tour leader. Great sights and tour leader. The tour guide was excellent. She was well informed and very sensitive to the needs of the group. The sunset dinner was amazing. Everything was perfect. I would recommend to friend and family. I would go with Colette again a 3rd time. It was the most wonderful way to visit Greece. I'm a cruise person but I choose a bus tour to be able to see it in depth. I saw places I never knew about it was incredible. Those villages in the mountains the people and those islands. Loved it. Everything was very well organized. When things had to change due to unforeseen circumstances, our tour leader did it flawlessly. There were too many memorable experiences to narrow it down to one. Walking dinner tour in Athens, tours in Athens, Meteroa, Mykonos, Olympia, Santorini and Mycenae - all were great. Sunset dinner in Santorini was wonderful. The food was great, our dancing lesson was awesome! Guide was very good and buses were comfortable. Any problems were quickly handed by our guide. Great to have a good 2 week tour of Greece and its Islands. Everything went well from pick up at home to airport transfer and pick up. Any gliches were handled well by our guide. Loved hotel in Island of Santos. The mainland part of the tour was fantastic. Did not care for Mykonos other than the San Marcos hotel (fantastic place). Santorini is much prettier than Mykonos. 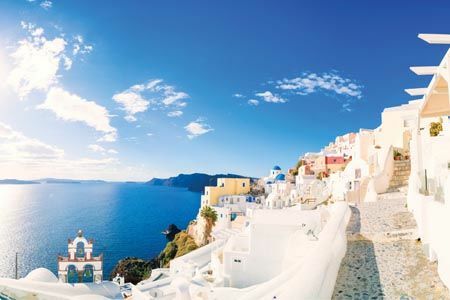 Consider doing more mainland Greece and have the option for going to Mykonos or Santorini. Would have preferred more mainland areas to visit. Having a website - gateway with the countdown to the date of the trip. Information about the destination country. Good balance in the tour - cultural, historical, culinary and leisure time. Good options available for additional purchase during the trip. Great schedule enough free time diverse program. Tour guide fantastic. Great tour. Diversity of tours. Great guide. Pleasant well informed. Able to adjust schedule when changes needed. Enough free time. Great choices for good tour adventures. Hotels good but need to reevaluate how to accommodate all travelers in rooms where views are important. Well done. Diverse and enough free time to enjoy the sites. I love Collette. In fact this is my 5th trip with them. I always enjoy my trips with them. Very educational. Each Tour Managers have their own way of leading the tour and so far I am satisfied. This last trip our Tour Manager *personal details removed by Feefo* is a very effective one. Very good leader and very knowledgeable . I enjoyed Greece so much because of her. Excellent experience. Food, scenery, and flowers awesome. Everything was taken care of, our vegetarian food needs were always considered, tour guides for all sites were excellent. The tour guide went out of her way to make sure we had wonderful experiences. I am not pleased with the hotels Collette had us stay in during the tour. None were centrally located, it was a walk, bus ride, taxi, or metro to get to anyplace you wanted to be! Plus there was the flood in the hotel on Mykanos. Our hotel room was flooded with an inch of water. The emergency was not handled by the management in the best manner. Also, there were no hand rails in the halls. We had to go down steps with a waterfall around our feet and nothing to hold onto! Again, I downgrade Collette on the hotels chosen. My favorite memory of the tour was Meteora. Thank you for bringing this to our attention. We apologize for the state of the hotels you experienced while on tour. We have passed along your feedback to members of our team for review. They will use your insight to help improve the tour for future guests. I think Warren & I enjoyed Mykonos the best. The hotel was excellent . We love the land tour as well. seeing the ruins was amazing. We don't have a thing t complain about re. Service. Our tour guide was incredible and went out of her way to accommodate everyone. This was our second trip with Collette and we would certainly use your company again and not hesitate to recommend you to friends and family. Only criticism is having multiple one night stays in a row. We understand that is sometimes hard to do due to distance between sites. I booked through a travel agent. Collettte was great about passing on communication about the trip. I really feel like I have truly experienced the entire country after the tour. We got to see lots of historical cites and also the beauty of the islands. There were lots of experiences included that you would never experience if you were planning the trip yourself, such as a dance lesson and a Greek cooking demonstration. It was a great mix of planned activities and free time. I would highly recommend the trip to anyone. They have done a great job organizationally and informing as to what will be covered. First dinner we had as an add on was not that good and we did not do the Athens by night tour that was scheduled with it. This was not our first tour with Collette and their service has always been great. But when my passport was stolen, Collette went above and beyond to assist us. I cannot even begin to express the amazing service provided when my husband was ill and hospitalized. Two for two: have had two great experiences with Collette tours. Collette is quite thorough in preparing clients for a tour and handling necessary arrangements at destination. Tour managers seem to be experienced and knowledgeable about country, culture, and sites, as well as being helpful and efficient. Tour was excellent. Well-rounded with historical site visits, local culture, pleasure points, and free time. Tour manager was top notch! Accommodations and meals were, for the most part, quite good. Overall, tour seemed to be good value. Wouldn't hesitate to recommend it. Too hard to identify single experience. Loved it all. 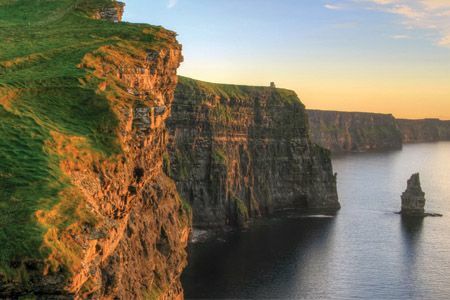 Beautiful country, rich history, gracious people. It would be hard to pick just one, but we enjoyed the cooking class, the time spent on Mykonos and the wonderful view of the sunset on Santorini. Visiting all the wonderful sites on the mainland were fantastic. We are planning to use collette for our next tour. Great tours but most importantly a fantastic tour manager--our tour guide was fabulous! 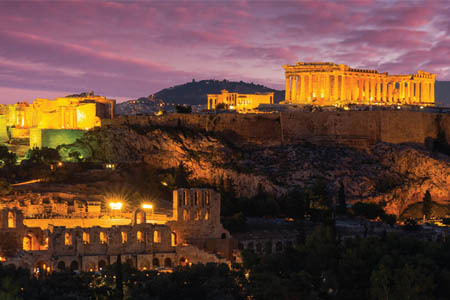 Discover the magnificent ruins of ancient Greece and bask in the brilliance of the Mediterranean. 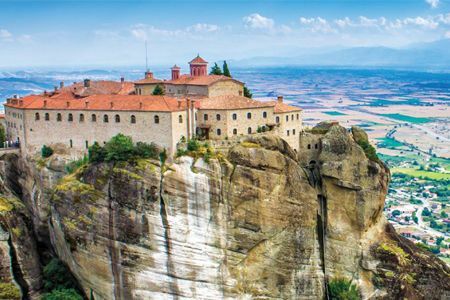 Discover the magnificent ruins of ancient Greece and bask in the brilliance of the Mediterranean on this well-paced journey. 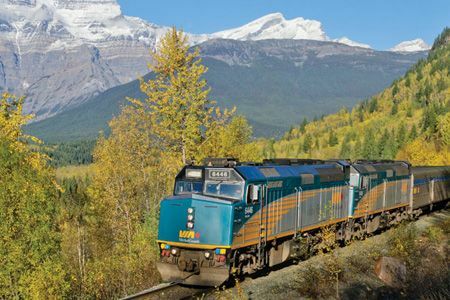 Many activities in this itinerary include walking on uneven terrain, or require significant walking at times. Some of the unique experiences, such as visiting historical areas, mean accessing locations by foot because motorcoaches are restricted. If you require a walker or wheelchair, or have difficulty walking, you may not be able to access some of these areas and may want to consider an alternate tour. Our travel counselors can provide additional information or assistance to help you determine the perfect trip for you. *Due to the ferry schedule on day 9 of some departures, you may be required to depart the hotel in Tolo as early as 4:00 a.m. Should this be the case, a boxed breakfast will be provided in place of the regular hotel breakfast. Luggage handling is not available when getting on and off the ferries in Mykonos and Santorini. Due to the nature of this itinerary, both 3- and 4-star hotels that may be located in the vicinity of historic centers will be utilized.